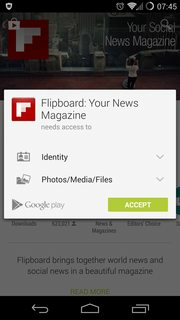 So recently, I was searching for a news app that needs few permissions as possible. I was satisfied with those permissions (left screenshot) and installed the app. Then I went to Privacy Guard (right screenshot; I have CM installed) to check if the permissions match. 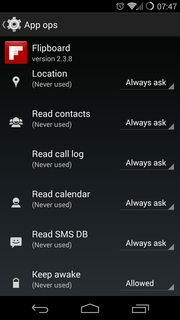 The permissions not only not match but there are additional that I would never allow, like reading my SMS or Read Calendar information. I know there can be additional permissions added with updates, but I never updated the app. To me it seems google/apps are misleading users and it seems very illegal to me. Am I missing something here or is my complain justified? Yes, you are justified and they are being sneaky. Once a set of permissions is allowed, it can install new permission into that same set without getting approved on update. But you can retake control. If your rooted, you can download the Xposed Framework installer from the XDA forums. "Xposed is a framework for modules that can change the behavior of the system and apps without touching any APKs. All changes are done in the memory." "This module aims to fix this problem for users who care about permissions. 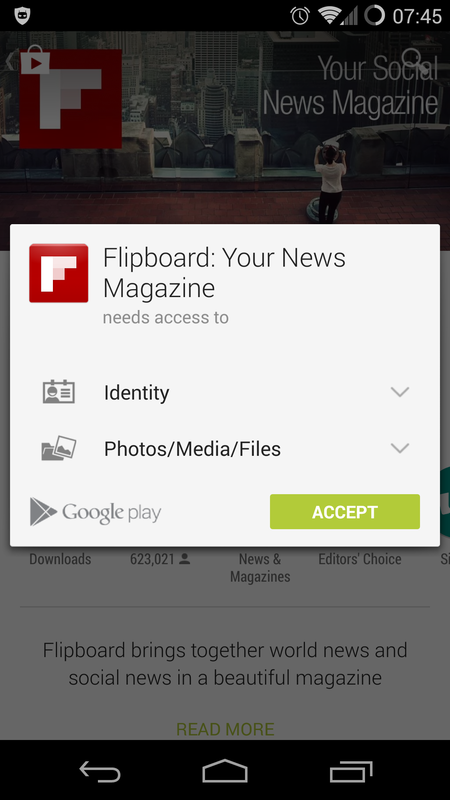 1.Make the Play Store show you all of the app's permissions. 2.Require you to manually update apps with new permissions (regardless of the category)." "XPrivacy can prevent applications from leaking privacy sensitive data. XPrivacy can restrict the categories of data an application can access. This is done by feeding an application with no or fake data. There are several data categories which can be restricted, for example contacts or location. For example, if you restrict access to contacts for an application, this will result in sending an empty contact list to the application. Similarly, restricting an application's access to your location will result in a set location being sent to the application." modules require Xposed framework to be installed to function properly. As of now, the only way to view all permissions before downloading from the Play Store is with the PlayPermissions module. Photo was included to show module in use. Please don't confuse permissions with services, activities, or broadcast receivers. Not the answer you're looking for? 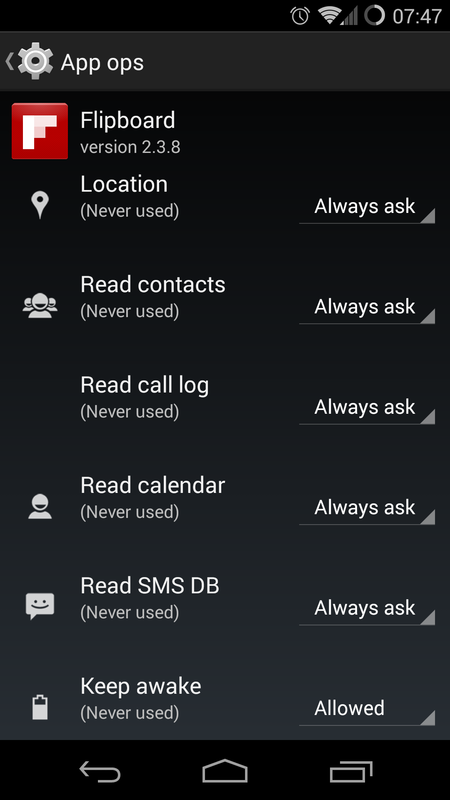 Browse other questions tagged google-play-store permissions privacy cyanogenmod or ask your own question. Are device administrator permissions a security risk?